The myTouch4G is “live” on the myTmobile.com page for existing T-Mobile customers and for at least one or two lucky readers, available for order. While we can’t confirm those orders many of you have reported that any attempts to go through the sales process end up being met by a “coming soon” screen. Of course, coming soon is just two days away so it doesn’t hurt to continue trying your luck and see if you can’t maybe, just maybe get your order in early! Let us know how it works below! Awesome to see the no contract price is only $449.99, but I’m going to wait another day and pick one up at a store. It’s available for me to order BUT there is no option for choosing colors =/ Just 2 MyTouch 4G options but like I said, they don’t notate color. Also, I have 4 lines and it’s not showing up for upgrade for a few of my lines only showing “coming soon” but for one of my lines it is showing as available for order… I want to but again, it’s not showing me a color and I want white and don’t want to risk getting another one. way too expensive, you say 199 with upgrade but it really comes out to 296 with 50 dollar mail in rebate… are we sure this thing is going to come out on best buy too? Wait a couple weeks and Amazon will have it for .99 cents. Amazon can’t keep up with Wirefly on price, and doesn’t offer all of the same rate plan options. They just aren’t a wireless specialist. $450 is a bargain for all that comes inside this phone. Vibrant is still my numero uno. No offense but if you spend 450 on any phone you aren’t the smartest cookie in the jar.. I know some people can throw money away like that, but in the end its just a phone. You still end up paying for the phone. If you do no contract, it is $450. If you do the 2-year agreement, you are paying an extra $20/month MORE than the no contract rate (even more plus plan). So, if you go with the contract, you end up paying $200 – $50 (mail in rebate) + ($20/month extra x 24months) = $630 dollars. It makes sense to go no contract, and buy the phone up front. Paying $450 up front looks to be a lot cheaper than forking over $630, and committed to 2 years! Been with Tmo for 6yrs now, I don’t see me leaving anytime soon. So, no reason to buy full price if you have no intentions of leaving. @Oce I’ve been with T-Mobile since the Powertel > VoiceStream days. I don’t plan on leaving them anytime soon, either. However, I don’t see the need to spend almost $200 extra for the same phone. If you think of it the other way around and in slightly bigger numbers like for rent. If I gave you the choice as an owner. I’ll give you $4500 right now for two years stay at your place or I’ll give you $2000 right now and $200 per month for two years. Most would definitely take the latter since it has a much better return. Anyone else scared this phone will get the same poor support its predecessor got? The cell phone biz is all about selling more phones and thats all. As of right now there is only one phone we know gets good support with updates, and that is the nexus one. Possibly the G2 but we have yet to see. How much of a discount do you get if you’re a AAA member? I’ll buy it at the store on Wednesday morning… an hour or two after they open. I’m waiting on the Nexus Two. That baby will be getting the updates first. Will this have voice recognition through Bluetooth? same here…was able to order but could not pick the color…makes picking the color easier I guess. I see the black, white, and red ones on Wirefly.com — no purple. It says expected delivery 11-8-10, and thats for 3 day shipping.I’ll just go to the store wednesday. whoa whoa whoa, really 450 off contract? I was expecting to pay around 500-550 plus tax. Hopefully this holds up cuz that’d be awesome. order went through got order confirmation number. Your early upgrade should be higher than that. I’d go to the store first. Full price is $499 and you’re gonna pay $449? That sounds like a 13 month upgrade. See what the store has or call customer loyalty. Yeah,This phone cost way more from T-Mobile, at wirefly I paid $149.99 $18 activation fee and $20 for next day shipping! 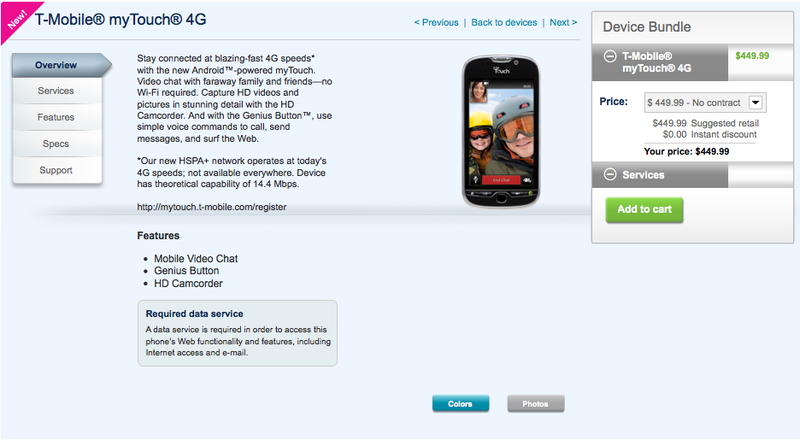 Wow :) $449.99 without contract is very generous indeed. yea, i didnt keep going to go through with the purchase because, as others have said, it doesn’t specify color. I want either red or black, i was thinking white but from the pictures the white looks as if the finish of it is glossy, and i would rather have the soft touch finish that was reported and the other colors look to have, which is weird, IMO. and I guess the upgrade i was up for is only partial, it showed $299 for my upgrade. and i dont see me leaving Tmobile any time soon, i am grandfathered into a $20 unlimited data/text plan, $30 voice. Wirefly.com is showing the myTouch 4G for preorder in red, black, or white. No purple. Bought mine tonight! Amazing device! how did u get yours already!?! I may go with the $449 price option. Looks like upgrading my MT3G (less that two years old) is going to be $299 with a 2 year extension, then they require me to get the new $30 MyTouch Unlimited data plan instead of the $24.95 Android unlimited plan that included T-Mobile HotSpots. Now for WiFi Hotspots it will cost another $10 per month. So $300 up front, plus 24 months time $15 additional equals $660….duh! I think ima go no contract, and use my upgrade when tmobile comes out with their 4.3in beast next year…tmobile does payment plans right?? Just noticed that the HD7 is also available for me on the pre-order… And that’s not supposed to be available until the 8th right? wait why is the G2 499 without contract? Wow. I grt the G2 & Vib at $124. Hope the mt4g is the same. Yep, you can break the cost up into 20 payments. It’s great! Wirefly is muchhh cheaper! just preordered for 149.99 no tax or upgrade fee. Idk bout your guys local tmo stores but the ones here in indy or being so dang secretive about the mytouch like when i ask about like price,colors, and any general question they go all cotton mouth and play dumb…I mean its like tmobile doesn’t want to people to know about the phone until its released which is beyond my understanding. I mean this is a big deal of a phone advertise early get the hype up same thing with the hd7 guess they’re afraid people will wait till a phone comes out then buy as opposed to buying a phone that same day. Yea…same here. Went to local Tmobile store today to get a look and the rep had to ask the manager was it ok (they didn’t have a demo out). He said it was ok so she went to the back and brought one out (that they had opened and played with) and let me hold it. They wouldn’t let me turn it on, just hold it. When I asked about the price and such they wouldn’t give me any info at all. In any case the phone is really nice. Solid and good weight. Pics don’t do it justice. I like it and will probably order one tomorrow from Tmobile directly so I can get my corporate discount.